Numerous climate scenarios predict an increase in average temperature and a global sea level rise which will have a significant impact on our coastlines, estuaries and man-made infrastructure. Worldwide many effects of raising temperature like changes in the precipitation and wind pattern have been observed already. Severe storms will appear more often with a higher intensity. More extreme and frequent flood events will damage infrastructure and critical buildings such as roads, power networks, water supply systems, hospitals, police stations and control centres of essential lifelines. Many buildings considered sufficiently safe today might be flooded in the future. To decrease future social and economic loss during flooding the critical infrastructure and buildings have to be retrofitted and flood defence measures have to be implemented. In many countries, risk and vulnerability analyses are used to identify people, property and infrastructure which are exposed to natural threats. The results of these analyses help to prevent accidents, to develop preparedness plans and to give advice for land use planning. New approaches are required for the complicated issues relating to floods in densely populated areas. Some of the methodologies which cover a general approach are very complex and expensive and very often require the participation of a team of experts. The aim of our research in WP2 is to develop methodologies to assess the vulnerability of networks and critical infrastructure buildings. We will investigate the interdependencies between different systems. Initially, for example, flooding of the urban water and waste water system, seems to cause “only” closed roads and basements full of water. On a second view we see that those flood events can lead to electricity breakdown with extensive consequences for the entire city. Next to the assessment of the vulnerability of critical infrastructure the second research focus will be on critical buildings. We will assess the condition of existing buildings before and after flooding. Detailed knowledge about the effects of flood on building materials and constructions and the costs incurred in restoring the buildings to use, will lead to the information needed in order to implementation of sufficient flood protection measures on existing and future buildings. Our risk and vulnerability assessment methodologies will assist the municipalities and infrastructure owners to get a clear picture where the weak points in their system and on their buildings are. It will help to avoid damages, to diminish fatal casualties and economical loss and to prepare our cities for future challenges. Defining the expression “critical infrastructure” is a challenging task, as no international consensus exists on the topic. Nowadays, an infrastructure is often described as a set of basic facilities, services, and installations that are necessary for the functioning of a community or society. The detailed list of actual objects that should be included within this context varies, it can include for example transportation and communications systems, water and power supplies, employment centres, medical facilities, and public institutions, including schools, post offices, and prisons. They are qualified as critical because a disruption would threaten the security, economy, public health, safety, and way of life of a community or society. Every day millions of people benefit from the availability of a highly developed infrastructure. Such infrastructure is a precondition for the smooth organisation of transport, communication, water and electricity supply. According to our modern, hectic lifestyles, we expect that the systems work without failure and the level of tolerance to accept traffic jams, delays in the railway system and power breakdowns becomes lower in an industrialized world. Natural disasters such as flooding can be sufficiently extensive to cause havoc to the entire lifelines in a city or larger area. In some cases the governance is forced to declare a state of emergency across a certain region. Even if the flooding is of minor extent it can cause severe damage to infrastructure and critical buildings in which network control units are located. To implement the correct protection measures, communities have to understand their risk of flooding. Risk assessment is a way to qualify and quantify the vulnerability of critical buildings and infrastructure. The following two case studies represent a part of the work, carried out in the framework of Work Package 2, Task 2.1. A risk and vulnerability case study was carried out in the city of Trondheim, Norway. Trondheim is a coastal city situated in the centre of Norway by the Trondheim fjord and the river Nidelva. The major identified possible origins of flood are: the sewer systems, the sea and the River Nidelva. Waste water coming from a combined sewerage system overflows during exceptional events of heavy rain and snow melt and frequently pollutes the river and the sea. Based on the flood scenarios in Trondheim, a total of 22 natural events, 18 scenarios regarding failure of the critical infrastructure components and 11 societal vulnerability factor sets were identified for risk assessment. The results are presented in risk matrices illustrating the consequences of flood events on people, economic damage, infrastructures and the environment. The assessment results can support municipal policy for risk adaptation and mitigation in the short or long term. Step 1: Definition of the scenarios by the user. Choice of the nature of the event (Natural versus technical) and of the severity of the event, through the return period. Step 3: Push the button "Calculate Risks", and then "View Matrices"
The use of safety assessment methods allows the possibility to design an approach for studying disturbances to urban networks caused by specific hazards, while also accounting for interdependencies between networks and using GIS. Starting from the conventional analyses of single networks, by cross-referencing these over several networks, it is possible to determine the exposure and vulnerability to damage to the entire combined system. Based on the network analysis, disruptions and impacts can be predicted for each network. The methodology has been used in order to determine disruption scenarios between different networks and we have investigated if these scenarios are valid based on the spatial analysis. Thus, these disruptions require the study of their impact on each network (feedback). An example of the application of the tool to a case study in Europe is shown in Figure 4,l and involves three networks. Networks are characterised here by weak densities although having some interconnected parts. 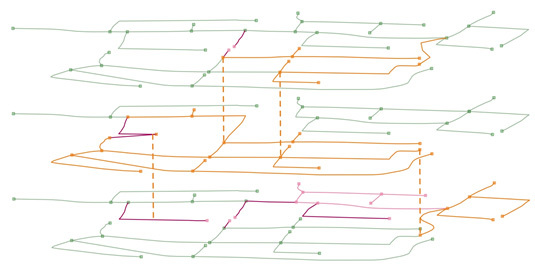 This very simple example is interesting because it puts forward the need to consider interdependencies (in orange dashed line) between networks. For instance, the electrical network does not suffer direct damage (in red) and direct malfunction (in pink) from flood hazard but it is damaged by the sanitation network. These damages cause malfunctions on a part of the electrical network. Then, failures generate new malfunctions (in orange) on sanitation and drinking water networks (by pump stations malfunctions). Figure 4: Three networks. Top: drinking water network; Middle: electricity network; Bottom: sanitation network. Existing damage prediction tools are aimed at producing damage curves for building types and contents, useful for groups of buildings at an urban level rather than individual buildings. They are therefore not precise enough to make accurate predictions about individual buildings. This deficiency does not help in the design, assessment or improvement of a building that delivers a critical infrastructure function. The lack of a flood damage prediction tool for individual non-domestic buildings has made it difficult for owners and managers to estimate the likely extent and costs of damage to their buildings caused by flood events. Without knowing these, it is impossible to make informed judgements on the cost/benefit of introducing flood protection and other mitigation measures to the buildings in order to minimise the costs of these damages and subsequent repairs, and reduce the time that the buildings are inoperable. One of the focuses of the EC 7th Framework Programme project, FloodProBE, is to examine the effects of flooding on critical infrastructure in urban areas, such as power systems, communications, essential supplies, emergency services and healthcare etc. If these infrastructure types are seen as networks, then the nodes are represented by the buildings and concentrated facilities that are connected together by communicating lines of various types (e.g. cables, roads, radio, pipes etc.). Task 2.2 is concerned with the development of a flood damage estimation tool that is particularly designed to calculate the extent and costs of damage of individual infrastructure buildings (nodes). Unlike domestic buildings, non-domestic buildings often feature several different types of construction within the same premises. This makes categorisation of buildings simply according to construction types insufficient.It is therefore a better approach to estimate damage at an elemental level – e.g. wall, floor, ceiling, services etc., rather than a whole building level. This would give a ‘menu’ that could be used to select the particular construction types used for the various elements of an individual building, and the particular building materials used, thus leading to far greater accuracy in the estimates of damage and consequent costs for repair or replacement. Damage predictions rely on accurate measurements of the effects of flooding on buildings of different constructions either from past events or as estimates based on technical information and laboratory tests on the different building materials. Owing to the wide range of building types represented in non-domestic buildings, a great amount of detailed information will be required. This volume of data has the potential to make any calculations required to provide reliable estimates very complicated and user unfriendly unless a sophisticated system is devised to facilitate the necessary inputs. Most damage predictions at present only take into account flood depth (i.e. they are stage/depth predictions). This will not be sufficient in cases where high velocities and levels of pollution are anticipated. Therefore the tool takes into account these additional flood characteristics that cause different kinds of damage to buildings, such as velocity, duration, different types of pollution, e.g. oil, sewage, sediment, as well as debris. Therefore, the function of the damage estimation tool is to predict the extent of damage to individual buildings depending on the severity of the flooding and the construction type of the building. The output of the tool expresses the damage in cost form. This will enable calculations to be made in order to assess the cost/benefit analysis of installing flood mitigation measures to the building and/or its surroundings. A simple diagram of the components of the tool is presented in Figure 1. Figure 1: Building flood damage estimation tool principles. The aim was to produce a simple-to-use system that will encompass the elements likely to be affected by flood water, namely the basement and foundations, the external walls, the ground floor, the internal partitions including the internal doors and joinery, the external doors and windows, as well as the associated services such as electrics, plumbing and ventilation. The tool is aimed at building professionalswith sufficient technical knowledge of the planning, construction and costing of buildings in question, such as architects, surveyors, facilities managers, quantity surveyors, and are comfortable with interpreting drawings and calculating areas of walls, floors etc. Identification of the main structural system. The buildingdivided by elements (external walls, floors, internal partitions, windows and doors, electrics, mechanical services, communications etc.). Each element is analysed according to the materials used and the layering of them. To simplify the range of options, a list of typical constructions has been devised from which a choice can be made. Areas of walls, floors etc. and numbers of doors and windows that are affected by the selected flooding. 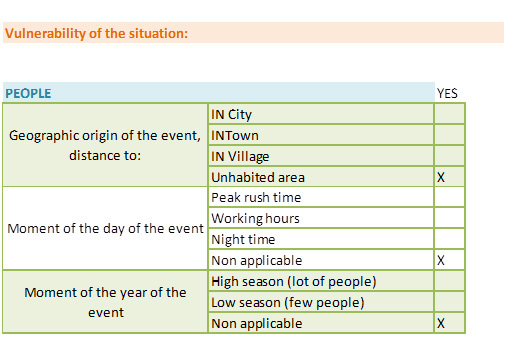 Types of services, their positions and layout and the extent of these that are affected by the selected flooding event . A database of common elements of different constructions and materials. A database of effects of flood damage to each construction and the % newbuild cost incurred by clearing up costs, repair/replacement of the affected area of the construction, assuming clean water. An additional percentage calculated to add for pollution of different types and combinations. A database of effects of flood damage to each of the different services installed according to their position. An adjustment factor calculated for regional differences. An additional percentage calculated to add for speed drying. by calculation (Nadal et al). Formulae available for different flood types (riverine, coastal – storm surges, tsunami) and debris impacts. Only applicable to concrete frames, concrete block walls, doors and windows, utilities and finishes. 3d damage curves, also indicating total damage. by depth/collapse curves (Davis 1985). This provides curves for wood, metal, masonry constructions for single and multi-storey buildings. The tool calculates the actual cost of flood damage to individual building elements according to their construction and materials, the types of services and the nature of the flooding. The example below shows a summary of the process for calculating the cost of flood damage to typical non-domestic building consisting of an office area constructed in load bearing brick/block construction and a steel framed production area clad in composite steel insulated cladding panels. 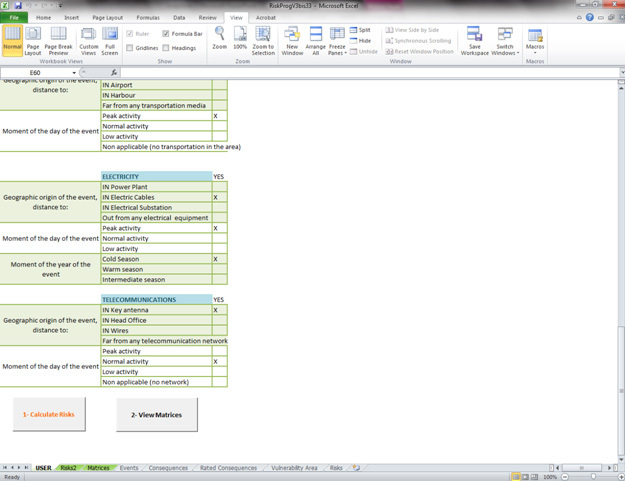 Table 1 summarises the characteristics of the flood event, and Table 2 illustrates a typical spreadsheet calculation as produced by the flood damage prediction tool. 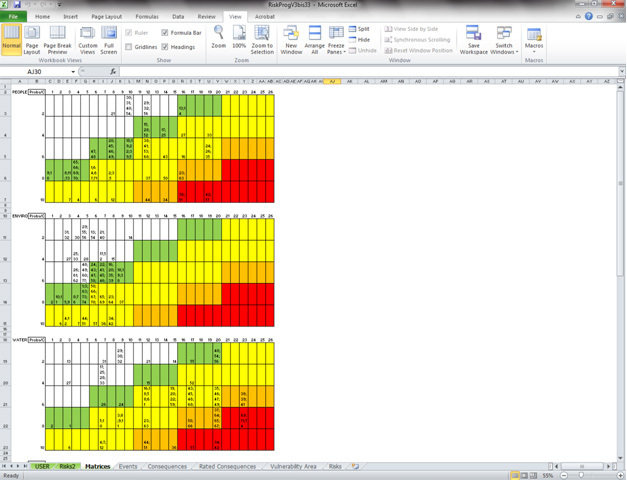 Table 2: Typical flood damage prediction tool calculations. The initial output, based on the database contained within the tool, predicts the cost of cleaning, repair or replacement, is expressed as a percentage of the new-build cost of each element. The percentage can be greater than 100%, reflecting the costs of demolition and disposal of materials, as well as cleaning costs prior to rebuilding. Additional percentages are added for pollution cleanup and sterilization and speed drying. An adjustment for regional factors (country etc.) can then be made. An approximate indication of the actual cost of returning the building to use, depending on where it is and when the flooding occurs, can then be produced by the tool when it is combined with calculations using the areas, lengths or numbers of affected elements,the current or predicted rates of construction prices. This tool can be used to compare the implications of flooding for different types of building construction, and to assess the value/cost of installing flood protection installations to the building to reduce the damage from future flooding. Repeated re-runs of the tool with different characteristics of flooding can be used to generate damage/cost curves for that particular building. It is evident that much detailed data on the effects of flooding on different building materials depending on their use in different constructions will be required to make this model accurate in its predictions. The aim of this research project is to devise the calculations required by the tool to make predictions from inputted and stored data, using available technical data, and then to test the outcomes against real building flood damage records from past flood events. The data contained in detailed records of these damages are being compiled from several sources. Permission has been gained to explore the flood records of the leading international insurance company AXA Insurance, from which six case studies have been selected. Links have also been established with relevant organisations and building owners who coped with the flooding in the Humber Estuary in the UK, including Yorkshire Water. The HOWAS21 database(Bavarian Water Management Agency) is also being used.This contains flood damage information of almost 6,000 buildings in numerous floods since 1978 in Germany. The database was compiled according to damage values estimated by damage surveyors of insurance companies who completed a standard questionnaire form on the importance of a great number of criteria. As a result, a list of 20-30 core criteria was identified for each sector, including buildings, businesses, infrastructure, agriculture and others. The data is divided into sub-sets by building functions, and is used to develop depth-damage curves. The database concept contains object-specific flood damage and damage determining factors using four core criteria: event information (type of flood, date, water level etc. ); object information (building type, building materials etc. ); damage information (repair and replacement costs for buildings and contents etc. ); information about loss reduction (flood mitigation measures, advance warning time etc.). holds a PhD in marine science from the University Kiel, Germany and is employed as a senior research scientist and research manager of SINTEF's Harbour and Coastal Resaerch Laboratory. Her recent field of research interest covers risk and vulnerability analyses for climate change. holds a Master Of Science from Grenoble Institute of Technology (G-INP,France) in Civil Engineering as applied to hydraulics. Her recent activities include hydraulical and hydrological modeling of urban networks. Manager of Floods Group at HR Wallingford, with over 25 years’ professional experience with HR Wallingford and Thames Water. He was the Project Manager for HRW on the EU Life SMURF project. He managed a research project at HRW for Government (CLG) and the Environment Agency, concerned with new guidelines for flood resilience construction. He was project manager for the major FLOODsite project, and sits on two BSI standards committees concerned with flooding and flow measurement. Principal Engineer with expertise in building flood resilience, urban drainage and river bank protection. With 25 years in engineering hydraulics, she has an extensive experience (15 years) of successfully managing applied research projects. She recently co-authored the guidance document “Improving the Flood Performance of New Buildings – Flood Resilient Construction” (DCLG, 2007). senior research fellow, expert in construction technology and self-build, and particular expertise on the management of research and research and development projects.